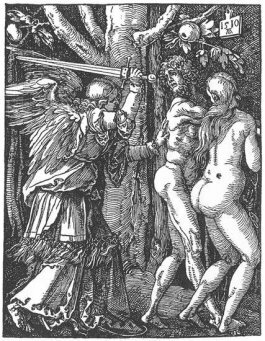 In art, the angel (usually one) is far more involved in the expulsion. Genesis 18 tells the story of the visitation to Abraham by what is usually thought of as three angels, although the text does not make this clear. Certainly, Abraham doesn’t recognise them as such. They have come to tell Abraham’s wife, Sarah, that she is to bear a child – 99 year-old Sarah is most amused by this. Unusually for angels, these three are rather hungry, and tuck in to the excellent spread provided by Abraham. 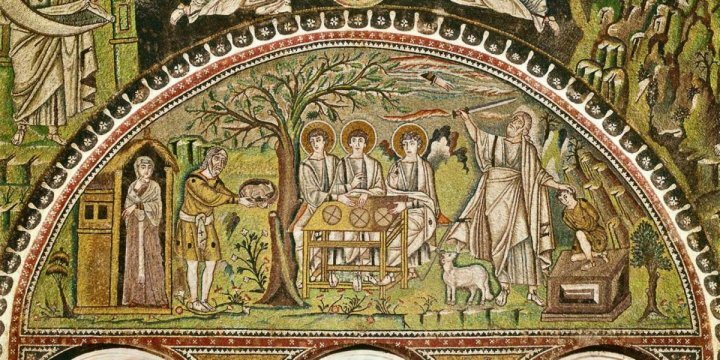 This beautiful mosaic in San Vitale, Ravenna, dates from the mid sixth century. There has been some debate about why the angels have no wings; as we have seen, these appeared much earlier. However, it does match the story; Abraham is unaware that they are angels. 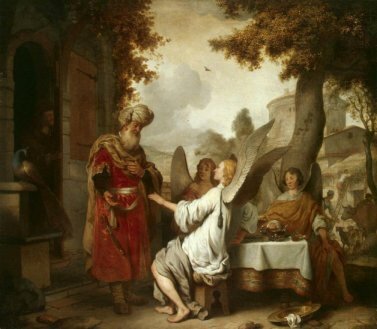 The painting by Gerbrand van den Eeckhout is rather less plausible; how could Abraham not realise what they were? One of the most familar Old Testament stories is the sacrifice of Isaac, popular beause it was seen as a prefiguring of the sacrifice of Christ. 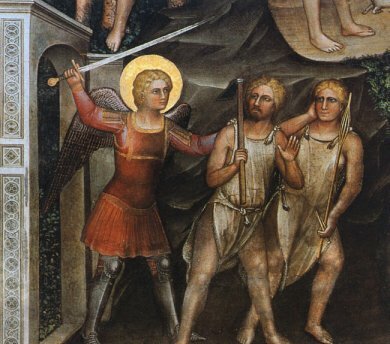 Isaac is saved just in time by the intercession of the angel: the unfortunate ram takes his place. 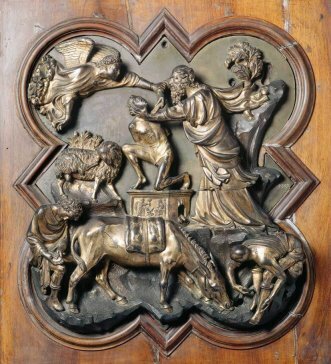 In 1401 a competition was launched to design and make bronze doors for the baptistery in Florence. Many big name artists entered. After much consideration, a shortlist of two was announced: Filippo Brunelleschi and Lorenzo Ghiberti. Here are their designs for the scene showing the sacrifice of Isaac; but who was the winner? 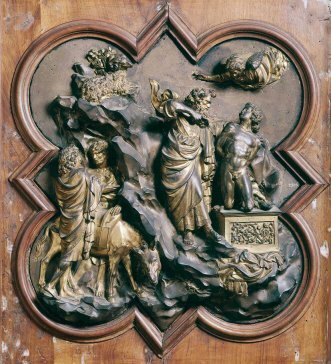 Ghiberti! Did the judges get it right? 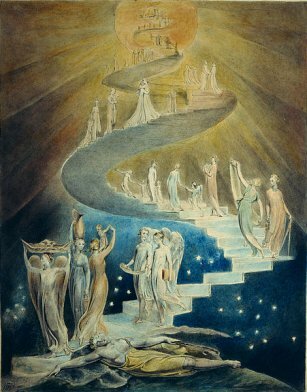 An incident in the book of Genesis that theologians have agonised over endlessly comes from chapter 28: Jacob's dream of the ladder reaching to heaven. The text suggests it refers to the difficulties facing the tribes of Israel, but some interpretations take a broader view and see it as referring to the struggle of mankind to seek salvation. 'And Jacob went out from Beersheba, and went toward Haran. And he lighted upon a certain place, and tarried there all night, because the sun was set; and he took of the stones of that place, and put them for his pillows, and lay down in that place to sleep. And he dreamed, and behold a ladder set up on the earth, and the top of it reached to heaven: and behold the angels of God ascending and descending on it. 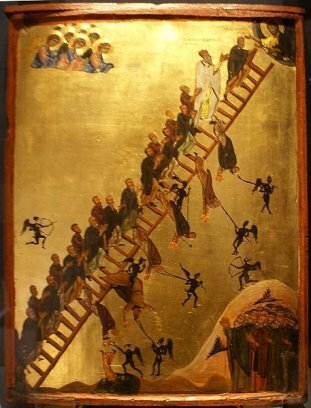 Ladder of Divine Ascent; Monastery of St Catherine, Sinai.